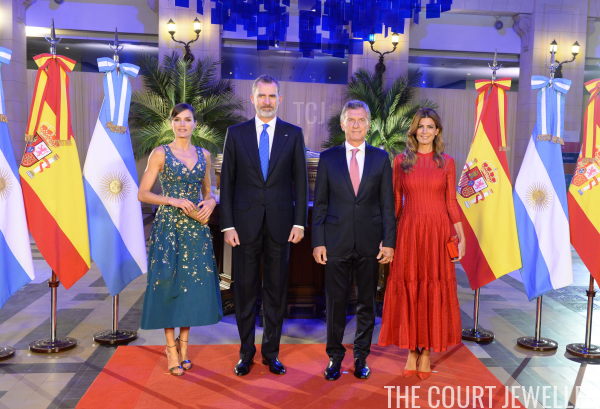 On the heels of last week's Danish royal visit, the Argentine government is rolling out the red carpet once more -- this time, for King Felipe VI and Queen Letizia of Spain. 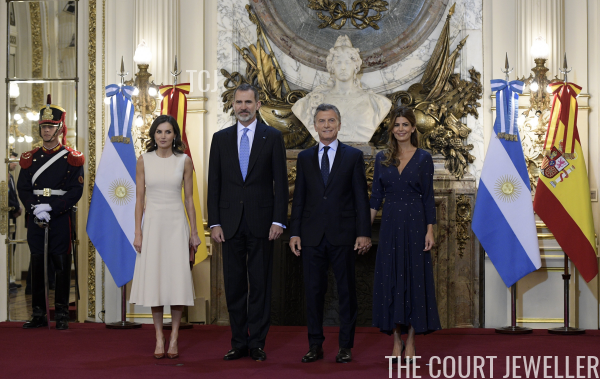 The Spanish royals began their three-day state visit to Argentina on Monday, starting with an official welcome ceremony at the Presidential Palace in Buenos Aires. 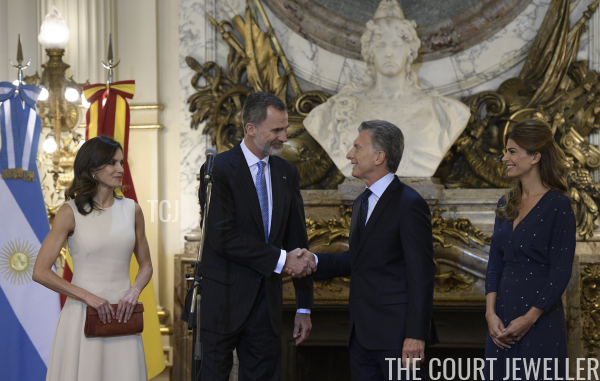 They were greeted by President Mauricio Macri and his wife, Juliana Awada. The First Lady chose an elegant navy blue dress for the ceremony, while Queen Letizia opted for sleek neutrals. Letizia made more of a statement with her accessories, though, wearing modern diamond earrings with pearl drops. For the gala dinner on Monday evening, we were sadly out of luck where major jewels were concerned. The men wore business suits, and the women wore dresses with minimal jewelry. Letizia wore a gorgeous gown embroidered with flowers. She accessorized with small gem-set earrings. Ms. Awada, who wore a very Letizia-esque red dress, also eschewed any major jewels.